When we define a table in Asciidoctor we might want to span a cell over multiple columns or rows, instead of just a single column or row. 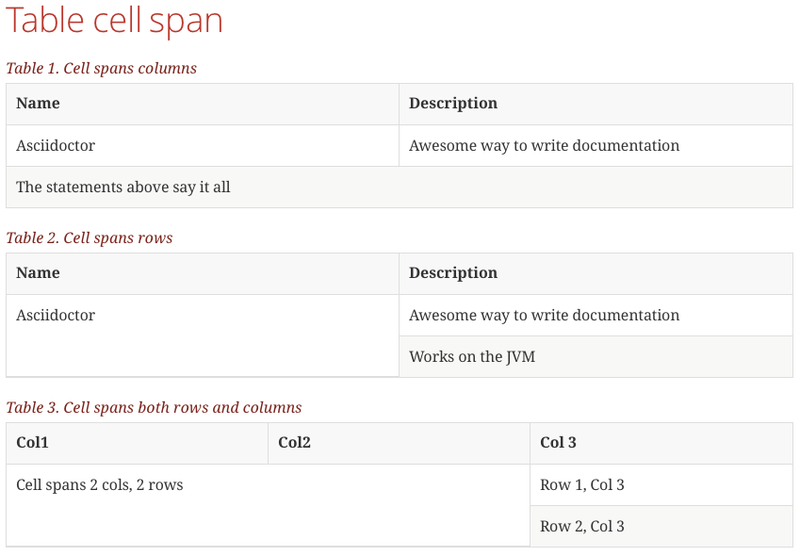 We can do this using a cell specifier with the following format: column-span.row-span+. The values for column-span and row-span define the number of columns and rows the cell must span. We put the cell specifier before the pipe symbol (|) in our table definition. In the following example Asciidoctor markup we have three tables. In the first table we span a cell over 2 columns, the second table spans a cell over 2 rows and in the final table we span a cell over both 2 columns and rows. // by the number before the + sign. // cell over multiple columns. // cell over multiple rows. // is the number of rows to span.